The Duane Mezga Holocaust Sites photograph collection consists of 682 digitized Kodachrome 64 color slides. 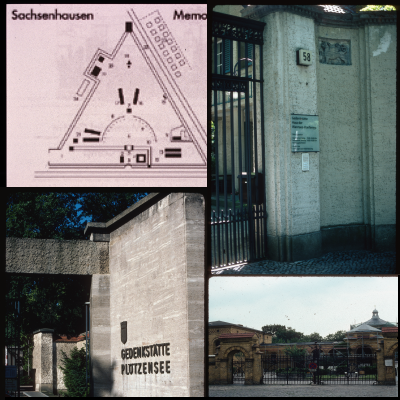 Almost all of the photographs were taken in 1992, of concentration camps and other historically significant sites related to the Holocaust. Twenty-one sites in Austria, then-Czechoslovakia, Germany, the Netherlands, and Poland are included. The photographs were taken using the progressive-realization technique, which captures the experience of walking through a site. Memorials present at these sites were a focus of the documentation. The photographs were taken by Michigan State University Professor Emeritus Duane Mezga of the Landscape Architecture Program. Professor Mezga led groups of MSU students to Europe in order to study these sites and memorials. He published on Holocaust sites and memorialization, and on post-World War II Polish city planning. The MSU Libraries gratefully acknowledges Dr. Mezga’s donation of his slide photography collection, as well as his contribution of crucial information about each photograph. The MSU Libraries also used the United States Holocaust Memorial Museum’s Holocaust Encyclopedia and Library of Congress Subject Headings to enhance the metadata for the collection. Now digitized, these images may be the basis of future learning and scholarship. Questions about the Duane Mezga Holocaust Photograph site should be directed to Deborah Margolis (deborahm@mail.lib.msu.edu). Click each link below to see all the photographs associated with a specific site.